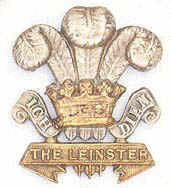 The Leinster Regiment Association reformed. To honour the memory of forgotten soldiers whose regiment was disbanded 83 years ago. November 2005 -- The Regimental Association of the Prince of Wales's Leinster Regiment (Royal Canadians) has been reformed to honour the memory of soldiers whose Irish regiment was disbanded in 1922. Descendants of former Leinster soldiers, together with other retired and serving soldiers who have some connection with the former regiment, are able to meet three times a year to commemorate the existence of The Leinster Regiment and to work to re-establish recognition for these forgotten soldiers who served Britain faithfully as an Irish Regiment of the British Army. Citizens of Birr, the home of the Regiment in Ireland, are encouraging the development of the Association that is currently based in London, England. Likewise representatives of the Canadian Military Authorities have given recognition to the Association in their attempt to re-establish commemoration of the Regiment and its former soldiers. Relatives of former members of the Leinster Regiment are encouraged to contact the Association to lend their support to re-establish recognition of the Regiment and its Association.